red bull is obviously the first can. 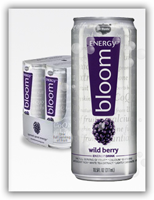 while in costco the other day i saw this 'bloom energy' drink. i fell for it. looked like an energy drink can (silver/skinny), and wild berry sounded intriguing (more than taurine energy drink flavor). i didn't bother looking at the ingredients and figured i'd give this energy drink a try. guess what. carbonated grape juice (with white tea extract which is the source of caffeine). yeah, not what i expected. tasty, but not energy-y. i was fooled by clever marketing. i saw another one the other day -- the flavor was "blood orange" -- i don't care what you say, anything that says blood orange, i'm buying. oh the heineken one? saw that on a billboard driving downtown one day. same thing: skinny, silver can. but it's beer. i wonder if it sells better.